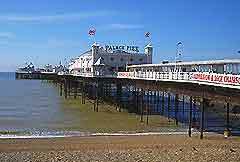 Brighton and Hove, on the south coast of England, is one of the top seaside resorts in the United Kingdom and has recently appeared in the top ten UK cities. Attracting more than eight million tourists each year, many of which are from overseas, Brighton is also a major conference centre and excellent conference facilities are available at the Corn Exchange and the Brighton Centre - which regularly accommodates more than 5,000 people. Forming one single region, Brighton has a lively atmosphere and nearby Hove tends to be more quiet and relaxed. In 2000, Brighton and Hove was given a city status and much of this region of Sussex has been restored and redeveloped in recent years. The Old Steine is a prominent local thoroughfare and connects the city centre with the Victorian pier, while to the west are the pedestrianised streets named 'The Lanes'. The district known as North Laine is to be found directly to the north and packed with bohemian flavour and appeal. To the east of the Old Steine is Kemptown, home of the city's legendary gay scene. Brighton's Tourist Information Centre (TIC) is easy to find and stands on Bartholomew Square, being a good place to pick up free tourism magazines and promotional material. Some of Brighton's most important tourist attractions include the spectacular Royal Pavilion - without doubt one of the most beautiful and unusual landmarks in the Brighton and Hove area, attracting almost 400,000 visitors each year; the world-famous Brighton Pier - formerly known as the Palace Pier, the fourth most visited leisure attraction in the United Kingdom, featuring arcades with state-of-the-art video games, a funfair with a mini-roller coaster, side stalls, a restaurant with stunning sea views and seasonal fireworks displays; the Clock Tower - built in 1888 to celebrate the Golden Jubilee of Queen Victoria; the Hove Lagoon - a popular centre for water sports with excellent sailing facilities; the Saline Centre - the world's oldest aquarium centre with one of the longest observation tunnels in the country; and Preston Manor - home to many important collections, including silver, antique furniture, paintings, sculptures and Sussex artefacts. 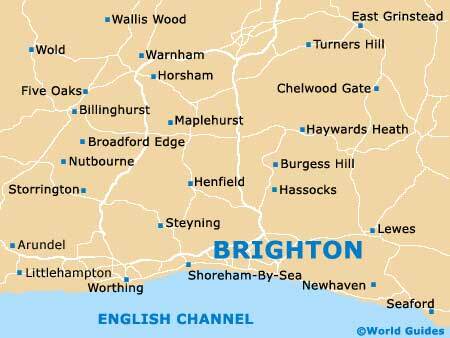 More information about Brighton Tourist Attractions and Brighton Landmarks. The popular Brighton Marina has become one of the largest yachting harbours in the United Kingdom and home to an enormous amount of entertainment facilities. Other areas and districts of importance in Brighton include Beachy Head - a scenic grassy cliff top with spectacular views across the seafront; the Lanes area - full of fascinating history and narrow, cobblestone streets; Devil's Dyke - owned and managed by the National Trust, with panoramic views of the surrounding countryside; and the Undercliff Path - a popular walking and cycling trail that stretches all the way from Brighton Marina to Saltdean. 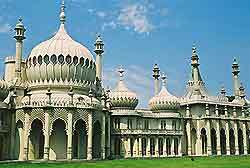 Brighton also has a number of excellent museums in the city centre. The most visited of these include the Brighton Museum and Art Gallery - one of the most popular museums in Sussex, with many important collections of early 20th-century ceramics, furniture, toys and artwork; the Museum of Penny Slot Machines - a museum of great historical importance and full of working, vintage machines, some of which date back more than 100 years; the Brighton Toy and Model Museum - with a fine collection of toys and models; the Booth Museum of Natural History - home to a wealth of interesting exhibits and displays, including more than half a million specimens and impressive dinosaur skeletons; the Hove Museum and Art Gallery - full of important collections and interesting memorabilia; and the Fishing Museum - celebrating the region's rich historic fishing past, which helped bring wealth and prosperity to this seaside resort. Situated on the south coast of England, the climate in Brighton and Hove is generally slightly warmer than the rest of the United Kingdom. 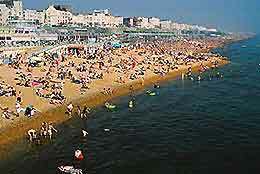 Brighton tends to have earlier springs, with warmer weather in the summer, combined with particularly mild winters. With excellent shopping facilities, impressive landmarks and numerous events and festivals, this is far more than a normal seaside resort and truly is an exciting city, well worth visiting.